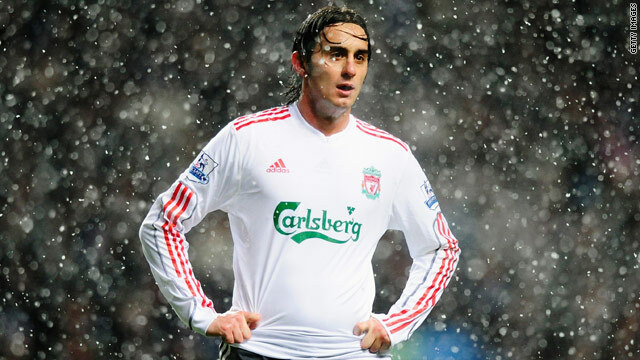 Liverpool's Alberto Aquilani has been deprived of experiencing more delightful British weather this weekend. (CNN) -- The freezing weather has ripped into this weekend's English football program with Liverpool's clash against Tottenham becoming the fourth Premier League match to be called off. The Anfield fixture on Sunday follows those that were due to be played at Sunderland, Fulham, Hull and Burnley on Saturday in falling victim to Britain's severe winter. As with most games at the top level, where all clubs have undersoil heating installed, the problem is with the area surrounding the ground and roads. A Liverpool club statement read: "The safety of our fans is paramount and an assessment of both the prevailing conditions and the weather forecast for the next 48 hours has been made in arriving at the decision to call off the match." The announcement means that only three English top flight matches; Arsenal v Bolton, Birmingham v Manchester United and Wigan v Aston Villa have survived the wintry conditions on Saturday, while Sunday's game between West Ham and Wolverhampton remains on. Elsewhere down the English leagues, the story is much the same. Just five matches survive in the second tier Championship, two remain in Division One (third tier) and none remain in Division two (fourth tier). Meanwhile, in Scotland, only five of the 16 scheduled Scottish Cup fourth round matches this weekend still remain.